Tomato is most susceptible to flooding stress. 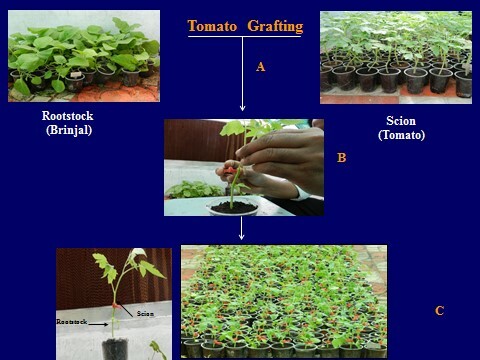 Since there are no flood-tolerant tomato genotypes available, root-stock grafting is considered as an effective and simple technique to combat flooding conditions. Different Brinjal genotypes were tried as root-stocks for Arka Rakshak and it was found that Arka Neelkant variety of brinjal is efficient and suitable root stock to combat flooding in tomato with lesser decline in the gas exchange parameters, photosynthesis rate(PN), stomatal conductance (gs) and internal CO2 concentration (Ci), chlorophyll fluorescence, leaf water potential (L) and chlorophyll content, accumulated higher sugars, starch, better survival and plant yield as compared to self-grafted and un-grafted plants. Splice grafting under 85% RH has given 80-95% graft success.